Being prepared for emergencies is critical for parents that the same holds true even if your "kids" have four legs instead of two. Cardiopulmonary resuscitation (CPR) can save your pet's life, and knowing how to perform CPR properly on cats and dogs can help you react quickly and safely in a life-threatening situation. No matter how beloved a pet may be, it is important to preserve your safety before attempting CPR on a cat or dog. During the crisis, be sure you are in a safe location and out of immediate danger before tending to your pet. While your pet will usually be unconscious when CPR is needed, be sure they cannot bite, scratch or attack as you help them, and stay alert for any signs of returning consciousness that may change your pet's behavior. An animal that is in pain, frightened and confused may lash out for its own protection, and as they start to revive they may initially be aggressive, even around their most familiar companions. Note: It is not safe to practice CPR on a healthy, alert animal. If possible, seek out local classes in emergency pet care or talk to your veterinarian to ensure you understand how to do pet CPR safely and appropriately. Position your pet on a flat, level surface, stretched out on their side. Check that the animal's airway is clear, and remove any obstructions if necessary. Gently pull the tongue toward the front of the mouth and close the mouth. Extend the animal's head straight out to allow for a more direct airway and easier pressure to refill their lungs. 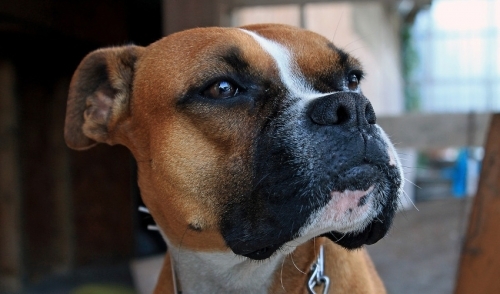 To breathe for larger dogs, keep the mouth closed and breathe into the dog's nose until its chest inflates. For smaller dogs and cats, breathe over their entire muzzle. Administer 1-2 breaths at a time before moving on to chest compressions. To perform chest compressions, place your hand flat on the widest part of the animal's chest and apply firm, fast pressure, compressing one-quarter to one-third of the width of the chest. If the animal can be laid on its back or it is a smaller animal, you may perform compressions on both sides of the chest simultaneously, using both hands. Apply approximately 15 compressions for every breath you have administered to the animal (30 compressions for 2 breaths). After each set of breaths and compressions, quickly squeeze the abdomen to help blood continue circulating back to the heart. Watch closely for any signs of your pet to breathe on its own, and check every minute or two for a pulse. When the animal begins to function on its own and regain consciousness, stop the CPR treatment. While it can be difficult to stop emergency treatments or admit they have not worked, if there is no improvement in the pet's condition 10-20 minutes after CPR treatment has begun, it is best to discontinue the treatment as there is little chance the animal will recover after that point. If your CPR efforts have been successful at reviving your pet, the emergency care is not finished. This emergency procedure can be very physically traumatic, and you may have inadvertently caused cracked or broken ribs, bruising, collapsed lungs or other injuries as you revived your pet. As soon as your pet has stabilized, seek emergency veterinary care to assess your pet's condition and check for any other injuries or problems. Knowing how to do pet CPR can save your pet's life. Be sure you understand how to do the procedure safely and appropriately for your pet, and both you and your furry friend may one day be glad you learned.